Seaweed or Sargassum Weed as it is called is found mostly in the Atlantic Ocean and comes in concentrations from the Sargasso Sea. Sargassum Weed’s name is a result of Portuguese sailors likening this ocean-dwelling species’ bladder’s appearance to small grapes called salgazo. Sargassum weed gravitates toward milder, more temperate and tropical oceans and farther toward shallow bodies of water. While some Sargassum weed attaches to the ocean floor, there are two species – the natan and the fluitan – that have become holopelagic, which means that they drift and migrate around the oceans and bodies of water throughout the world, though they are mostly concentrated in the Atlantic Ocean and surrounding bodies of water such as the Gulf of Mexico. Sargassum weed acts as a mobile transport habitat for a great variety of marine life and as sublime refuge for young fish that may lack mobility. When young fish find a safe haven in Sargassum weed, they are far more protected from the ocean’s predators, thus making it possible to survive to adulthood. These patches of seaweed as we call them provide shelter, food and a place where schools of fish may form, further protecting young fish and other marine life. Many species of marine life take refuge in the Sargassum weed and travel thousands of miles with this floating habitat, seeking protection and survival. With the presence of all of these young fish in one location, large fish often hover around, awaiting a shot at the young prey. All of this serves as a great advantage for anglers in search of the predator fish. August is in my opinion the best month for offshore fishing along the upper Texas Coast. Anglers able to make it 20 miles out should easily locate this fishing phenomena and the variety of fish in and around it. Chicken Dorado, as the smaller of the species of Dorado are called, attack small bait with a vengeance and fishermen focusing on weed lines and patches mop up on them. One nice thing about Dorado is that there are no bag or size limits; however, with that being said, good stewardship dictates taking only as many as you, your family and friends will consume. 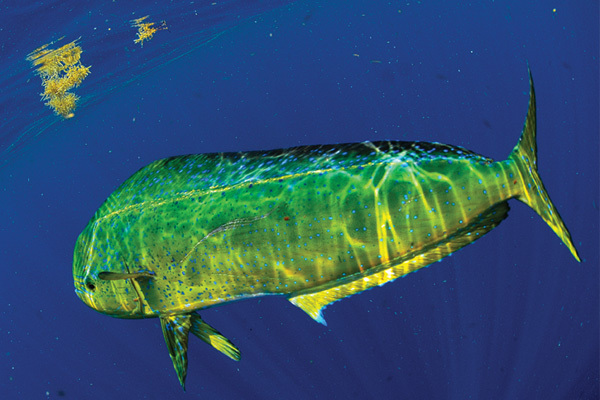 For table fare, Dorado are among the best fish in the ocean. Other fish commonly found among seaweed are all of the pelagic fish, tripletail and all sorts of small bait fish. Offshore anglers fishing off of the Texas Gulf Coast encounter basically two types of seaweed concentrations. Weedlines and Weed Patches. Weedlines are, as the term suggests, long lines of seaweed clumped together along a tide line or water color change. The patches are big clumps ranging in size from a few square yards to several acres. One of the best ways to fish long weed lines is to troll both sides. However, often there is so much scattered seaweed along the edges that trolling can be frustrating as the lures keep getting clogged with the weed. Drift fishing is the other popular method for fishing around seaweed and is the method of choice if trolling is a problem. Once a strike takes place, it is a good idea to chum the area to keep the schools of fish nearby. Dorado in particular will continue to feed although others in the school are hooked and fighting for survival. Capt. 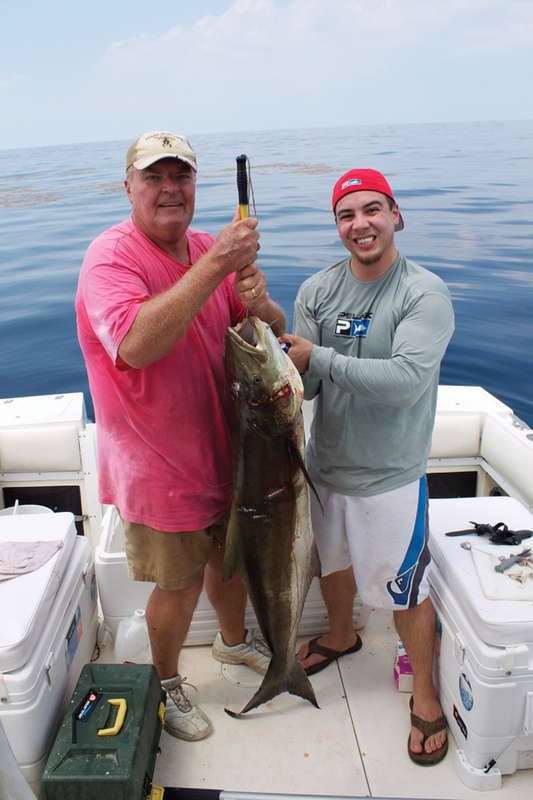 Joe Kent and Gulf Coast Mariner Magazine Creative Director, Brandon Rowan with a 65-pound ling taken from a weedline. Some of the largest ling I have caught have come from seaweed concentrations as there is another benefit that comes from the big concentrations and that is shade. Ling and Dorado love shade during the heat of the day and seaweed definitely offers that benefit. Just about any bait used otherwise for offshore fishing will be good for fishing the weed lines and patches. The idea is to keep the bait suspended anywhere from the surface to just a few feet below. One of the best ways to test an area is to toss some chopped bait into the water. If fish are nearby, they normally will come check it out and you can actually see your target. Fishing around seaweed offshore is one of my favorite types of fishing. If you have not tried it, chances are you will share my enthusiasm once you experience it. 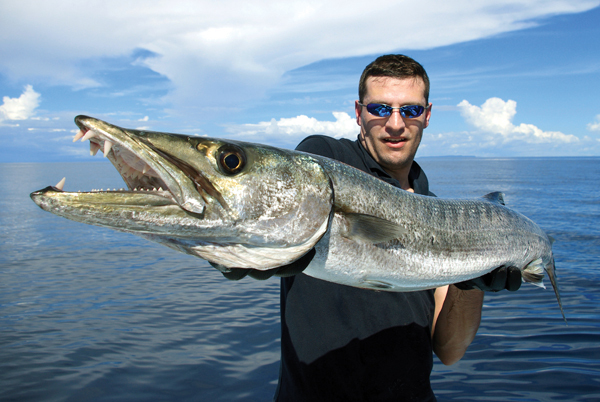 Barracuda can provide a fierce fight on light tackle. I have been looking forward to this first article for the Gulf Coast Mariner Magazine ever since the invitation was received to write the fishing articles. First, let me tell you something about my background in fishing. Fishing has been a life-long passion of mine. One of the reasons I decided to take an early retirement from the legal profession was to devote more time to my passion in life. 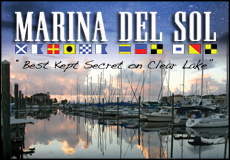 I have been a licensed captain and fishing guide for over 15 years, operating Sea 3 Charters Guide Service and writing daily fishing articles for the “Galveston County Daily News” and several magazines. My wife and I live on the water in Galveston where I have easy access to fishing upper West Bay and other spots including the offshore waters of the Gulf of Mexico. I have fished both offshore and inshore waters along with the surf and jetties. With that, let’s get started with the fishing column for “Mariner Magazine”. 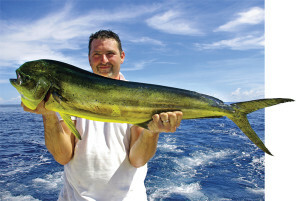 By the time most anglers read this column, we are going to be entering the 2013 offshore fishing season. Beginning Memorial Day Weekend and going through much of September, our migratory pelagic species of fish will be roaming the waters of the Gulf not far from shore. 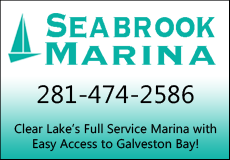 This time of year, especially during July and August, is prime time for the smaller boats, collectively referred to as the Mosquito Fleet, to make Galveseton offshore fishing trips. The Mosquito Fleet will venture well within its fuel range to spots that offer action on a variety of fish including king mackerel, ling, Dorado, bonito, sharks and many varieties of reef fish. Not all boats are suitable for making journeys beyond the jetties; however, those that are can, find action as close as eight to ten miles out. So, what does it take to go deep-sea fishing and what will you find in the way of fishing spots within 10 miles of shore? First, the boat needs to be seaworthy, meaning that it can handle a sudden squall with strong winds and choppy seas. The length is not as important as the style of hull. Boats as short as 17 feet fall into that category. 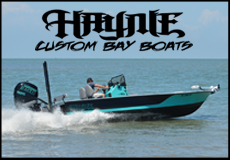 Flat bottom boats and others designed more for inshore waters are not safe at anytime in the Gulf. 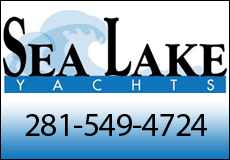 A whole article could address what is considered a seaworthy boat and discuss the equipment needed to make it offshore. One of the best approaches is to make a trip in tandem with another boat. Offshore anglers generally target structure whether visible like wells and platforms or subsurface like rocks and reefs. Weed lines and anchored shrimp boats are other popular destinations to find fish. 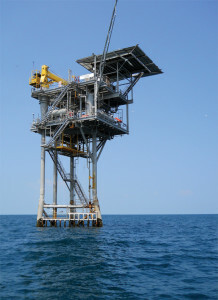 Within 10 miles of shore mostly wells and platforms commonly called oil rigs are the top choices. Beginning in July anchored shrimp boats and weed lines add another dimension to the offshore selection. Each area has its own unique way of being fished. More on that aspect will come in a future article focusing of offshore fishing. For now, the objective is to give an overview to the small boat operator who has not ventured beyond the jetties. The required fishing equipment will be heavier than typical trout and redfish tackle; however, the big rods and reels that are commonly associated with offshore fishing are not needed for a short run offshore. Most of the surface fish, such as king, ling, Dorado, bonito and sharks, are going to range in size from close to 10 pound to 30 pounds. There will be that occasional hook-up with a really big fish well beyond that size range. One of the keys is to have enough line on your reel to play your fish. For this type of fishing, line strengths of 20 to 30 pounds are the most common. There are lots of structures in the waters off of Galveston and around them are concentrations of reef fish of all sizes. For this type of fishing, anglers normally use heavier equipment in the 50-pound category for mainly dragging the fish from the structure, as most everything that has been underwater for a while is covered with sharp barnacles that will easily cut line that comes in contact with it. 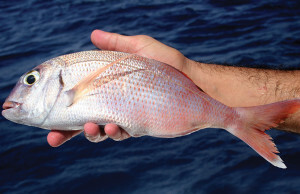 Many varieties of snapper can be found within 10 miles of shore. Your choice of bait will differ from inshore fishing where live shrimp is one of the top choices. While live finfish such as piggy perch and mullet are top baits, frozen Spanish sardines, ribbonfish, squid, ice fish and cigar minnows are widely used. Trolling is a popular way to fish for the kings and other surface fish; however, newcomers tend to prefer drifting natural baits (mentioned above). The key here is to keep the bait close to the surface. If you are new to fishing the offshore waters, once you make that first trip and hear your reel scream with a strike, you will be hooked. It is music to the ears of old salts. Have fun and put safety as your number one priority. Tags: galveston offshore fishing, galveston red snapper, how to catch dorado, ling, oil rig fishing, what offshore bait?